Tesla will be moving in Boston to Boston Properties newest building, 888 Boylston Street. Tesla will among strong peers in the retail tech space with the following neighbors: Apple, Microsoft, Verizon & AT&T just in a 2 block corridor. 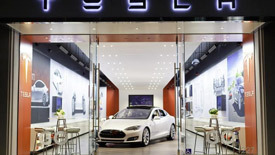 Although Tesla spokeswoman Alexis Georgeson wouldn’t disclose many details, she told me that the company (Nasdaq: TSLA) is relocating its store from within the Shops at Prudential Center to the more visible Boylston Street space by the end of the year. 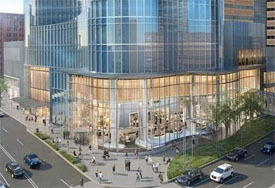 Copley Square is going to see some major upgrade to Copley Place. Simon Properties in planning major interior and exterior upgrades with completion in the Summer of ’16. You can read the original post, here. Boston is under a major construction boom which is evident as you look across our skyline. The John Hancock tower was a major milestone in our city when the project broke ground in August of 1968. 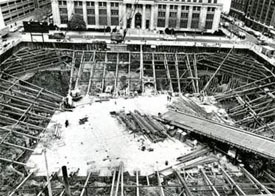 The groundbreaking ceremony for New England’s tallest building, the John Hancock Tower, was on Aug. 21, 1968. The 60-story minimalist structure was constructed with huge panes of reflective glass that proved to be a problem in the 1970s. Many panes of glass crashed to the ground with high wind speeds, causing street closures and huge safety concerns. After pane replacement and structural fixes that stabilized the tower, the actual cost of the construction nearly doubled the projected budget.